Set of six baby duvets with an anti-rollover flap, available in a wide variety of colours; can be customised to suit your needs. Our single-use safe and cosy baby duvet is the ideal solution to concerns about the security and hygiene of young children. It comes with 15 cm (6 inch) flaps on each side which can be wrapped around the cot's mattress to keep the duvet in place, greatly reducing the risk of suffocation for the child. This product, specially manufactured by our parent company, Caractere Paris, is designed for children from approximately 1 to 3 years old, with some flexibility either side. 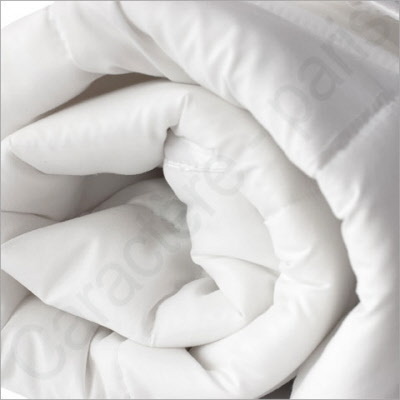 The duvet is intended to last about a week, depending on the hygiene of the child and the parents' preferences, and after use can be thrown away. Soft and comfortable, it is hypoallergenic and comes vacuum-sealed in individual bags direct from our factory to ensure hygiene. Colours: Blue, Light Blue, Golden Yellow, Light Yellow, Salmon and Light Green. Quantity: Box of 6 individually wrapped duvets.